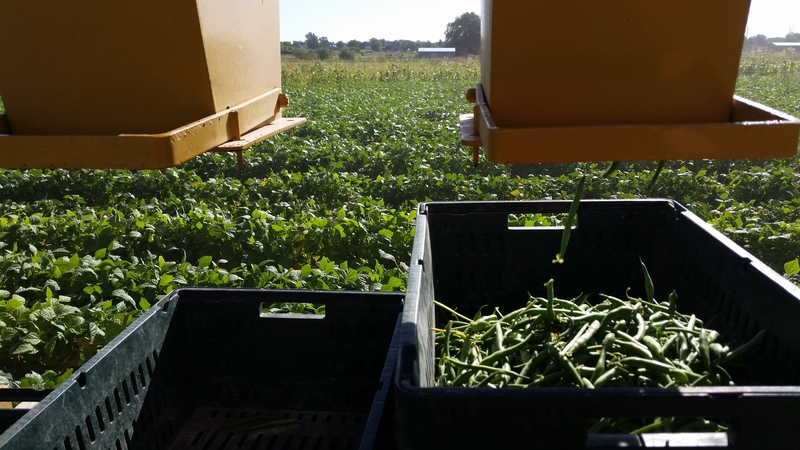 One of our new ventures this year has been buying a green bean picker and growing three acres of green beans. The thought and talk of it was crazy to me when the idea came up. 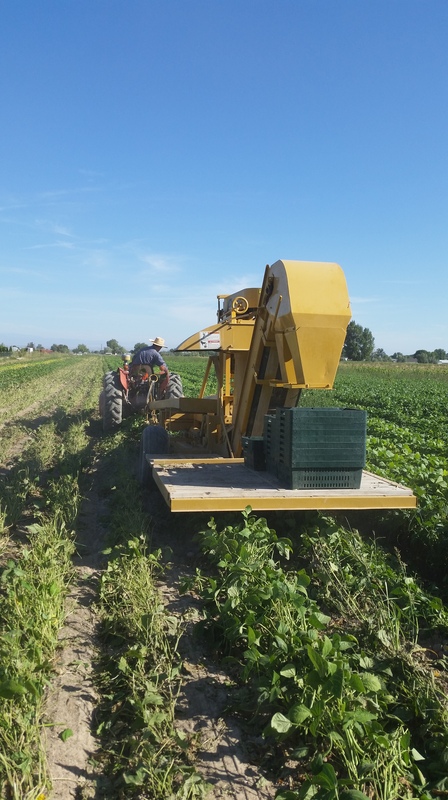 The picker saves a lot of work and back ache, but when it picks the beans the plants are done. It leaves the plant in the ground but strips the plant of most of its leaves. So you get one picking off a plant instead of one picking every week on all the plants from July to freezing. I honestly didn’t think it would be profitable to pick the plant just once. I’ve always loved hard work and have always been willing to work. So my thought was to just get out there and pick the beans by hand to get the most out of every plant, the old-fashion way. I’m not sure about new technology. But with picking by hand we can’t raise several acres or even one acre of beans, it was more like ⅛ acre of beans and then it took both of us several hours every week to pick the beans. I could average picking about 30 pounds of beans in an hour, the other half is slower so the pounds of beans added up slowing with hand picking. Then your back would start aching, we would stand up and stretch looking toward the end of the row and it seemed so far away. Hand picking beans would get old in hurry every year, but in my mind that is the only way to do it. So I just buckled down and got it done, even if my back ached and it looked like I would never make it to the end of the row. The other half was not sold that hand picking is best for us. 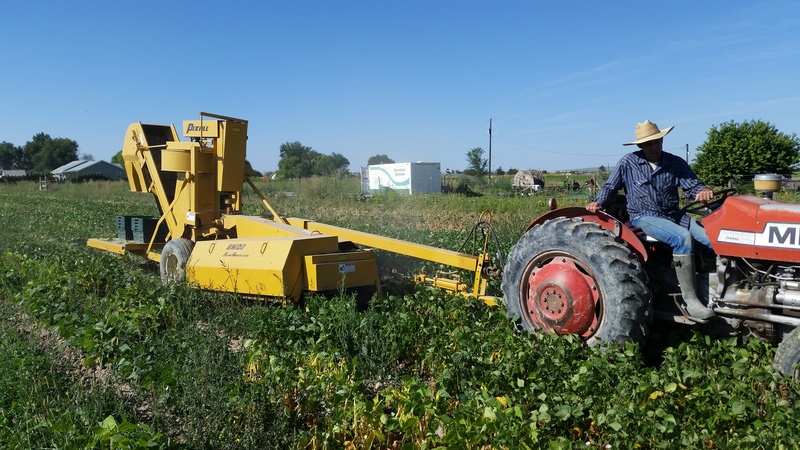 There is also the fact that we are growing acres of a large variety of produce that needs to be harvested on a weekly or even every other day basis. The other half starts doing calculations, throw numbers out there about profitability and how good this piece of equipment can be. And it will save me lots of time since I won’t have to pick the beans this year. Well, that was an enticing thought. So we bought the Pixall BH100. The plan was to start planting as early in the spring as possible and plant 4 to 12 rows every week. That way we would have beans ready every week from July to freezing just like if we were hand picking the same rows all season long. Except with the beans picker we have a lot more beans to sell every week. 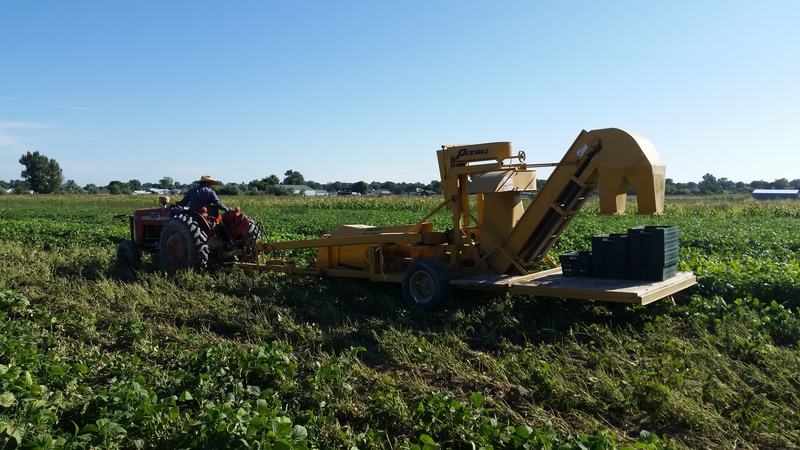 With the picker, we (it takes two people to run it) can pick around 1000 pounds of beans in an hour instead of the 50 pounds or less that the same two people would of picked by hand. It is very exciting to pick so many beans in a short amount of time. We are able to fill more orders and that is very satisfying. The downside is that I still have to be involved with the bean picking and boxing. 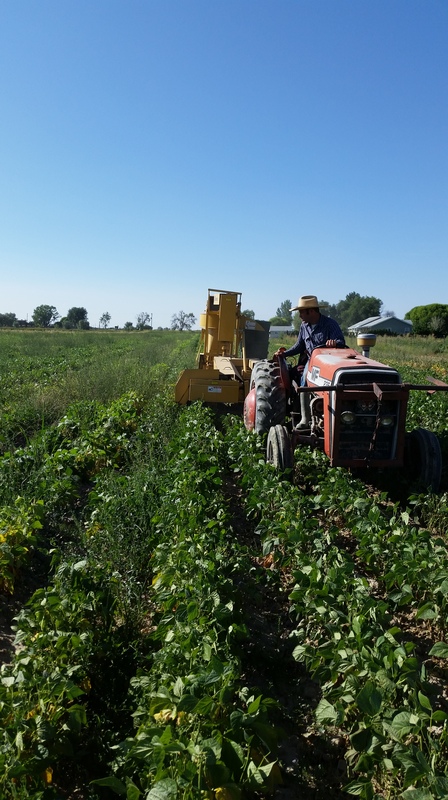 Since it takes two people, the other half drives the tractor and I ride on the picker picking out the few leaves, stems or weeds that make their way through with the beans. 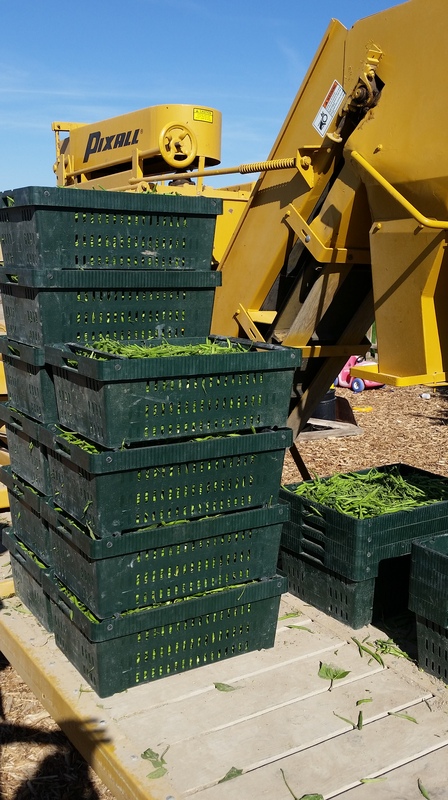 I also switch the handle from one shoot to the other and stack the crates of beans as we go through the field. Another downside, or maybe it’s a learning curve, is timing the picking just right. We go out to check the beans and there are too many pin beans on the plants which means we need to wait for them to mature to a good sized bean or if we pick them then there is lots of sorting the pin beans out. And if you pick the beans too small like pin beans then we are losing beans and money. Wait four days and then there are too many overly mature beans on the plants, which also means lots of sorting to get them out. Or the beans are so far gone that we have to just leave rows of beans in the field to disk under. That is very discouraging and disheartening to do when you are trying so very hard and working so hard to make a living at small organic farming. We are still working on mastering the art of timing the pick to that perfect time and praying we can perfect it before we have to leave any more rows of beans in the field. Since our bean picking season won’t be over until it freezes, we don’t know how profitable it is yet. We have to sell enough beans to cover the cost of the picker, our time, expenses of regular maintenance and then have money left over. We are not sure that is going to happen this year, but the picker has been nice to have. My back doesn’t hurt and I don’t look at those rows like they are never ending anymore.The discouraging part now is having to clean, sort and box hundreds of pounds of beans every time we pick, which has been three days a week. That is still better than having to pick beans by hand for three days straight every week. It has been a couple seasons since you brought on the the green bean picker. Have you found it has netted you guys in the black yet? I am a fellow organic veggie farmer up in Canada, and I have no love of the bean harvest. We will pick a few hundred pounds every other week or so. People always want more beans, but I cant allocate any more labor time to pick them. It definitely makes harvest faster and easier. But you need to have a market for lots of beans for it to pay for itself; several thousands pounds per season. The problem with it is: it’s a single use piece of equipment, used only for green beans.